Today, I feel there is something I need to let you know about, here on Life with Lynnie (LwL). It's not something that actually happened today. It's something that happened... yesterday! Yesterday, was SONday! Sunday, is the day when I go to worship, with church family. Just as many people say they also do. Did everyone go to worship, on our Lord's Day? How did I know this happened? Actually, I must admit that I didn't realize something different would happen. But, after it did, and I got home, I looked online and found an article that mentioned what happened. Wow! Please click on this link by windsorstar.com that is entitled, What's going on in Windsor - Essex: https://windsorstar.com/special-features-3/whats-going-on-in-windsor-essex. If you clicked on the article, you would have seen various things listed. In the past, I hadn't seen anything like that, but after arriving home, I did... as I already mentioned. 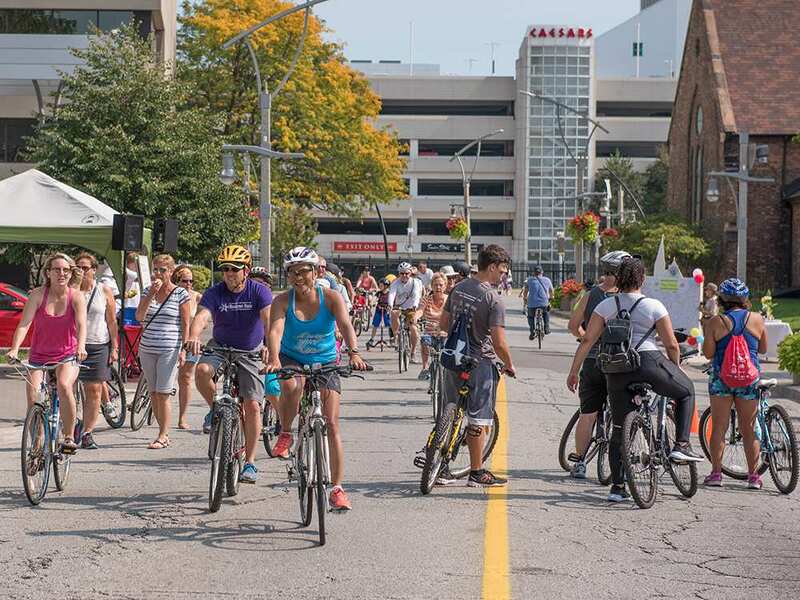 Cyclists and pedestrians can enjoy streets free of traffic during Open Streets Windsor Sunday, Sept. 23 from 10 a.m. to 3 p.m.
To me, this was truly upsetting. As I mentioned, I didn't know this was due to happen. But, it did. When I was driving to go worship, I found that in Windsor, Ontario, Canada... Wyandotte St. E., was closed. That was where people could walk and/or ride bikes. However, not only was Wyandotte St. E. closed off. It seemed at first like EVERY street that would cross over Wyandotte St. E. was also closed off. I did everything I could to drive to where I was going to worship. However, at first there was NO streets that I could use to cross over to go south of Wyandotte St. E.
Eventually, I found a street that did allow drivers to be able to cross over Wyandotte St. E.
Even so, it took me almost an extra half hour to be able to drive where I needed to go, so I could worship God. After the worship service was over, we spent time together. Some had some lunch together, and some just did talking. When I left the church group, I headed over to the west side of Windsor. Why? Because I needed to see someone, who was going to be able to provide me with something I feel that I need to help my health improve. Knowing that Wyandotte St. E. was still closed, I took a street that was parallel and drove west. When I approached the street that had allowed me to find my way earlier in the day, to be able to get to where I was going to worship, I turned onto that street... and this time, crossed over Wyandotte St. E. heading north. I knew that by doing this, I could drive along University Ave., to make my way to where I was headed. Did I get to where I was headed? Not at first. Apparently, the closing of Wyandotte St. E. had changed, in the area near where the Casino is located. I wondered if the Casino enjoyed this happening, because then many people could stop for a while and enter the Casino, for food and gambling. If you know our city, then you'll realize that a street heading north, was closed. And, when I was driving along University Ave., it was shut down! There was no way for me to be able to drive along University Ave. Nor, could I find a way to be able to cross over University Ave., so I could try to head to the street where I was driving to. I ended up driving almost the entire distance of Windsor, heading west. No streets allowed anyone to cross over University Ave., until we arrived by the Ambassador Bridge where the street of Huron Church was located. At the corner of Riverside Dr. E. and Huron Church Rd., traffic was stuck. Police were there. I spoke with a female as to why all the roads were shut. This female police person let me know that the University of Windsor was having fun times/issues. Then, I had to make my way in a lengthy group of drivers, to Wyandotte St. W., and make my way back eastward to where I was headed. It took me almost another extra half hour of driving to make it to arrive and park near where the lady I was to see, lived. To me, it was truly upsetting. Not just because I had to drive for a total of about an extra hour. Not just because of the amount of gasoline used was increased. Also, because it seemed that no one had told us that this would happen. Nor, did anyone even care about anyone driving. However, the worst to me, was that it showed me that there were so many people who were not going to worship. After all, most groups who worship do so through the same time limit that created the streets closing to happen! This touched my heart the most. God wants us to worship! And, true Christians will want to worship Him. Thinking of this, made me think of John 4:23, "But the hour cometh, and now is, when the true worshippers shall worship the Father in spirit and in truth: for the Father seeketh such to worship him.". Amen! But the hour cometh, and now is, when the true worshippers shall worship the Father in spirit and in truth: for the Father seeketh such to worship him. Please, realize that even though the City of Windsor allowed that street closing to occur throughout most of the day time when church groups gather to worship, those who claim to be Christian, didn't go to worship, when they did the walking and/or bike riding. I prayed. And, will continue to pray, for people need to truly become a born again Christian, by trusting in/believing upon our Lord, Jesus Christ... for then they will gain salvation, and want to focus on Him. Plus, they will then want to worship.